>> How many Gmail users are there in the world? 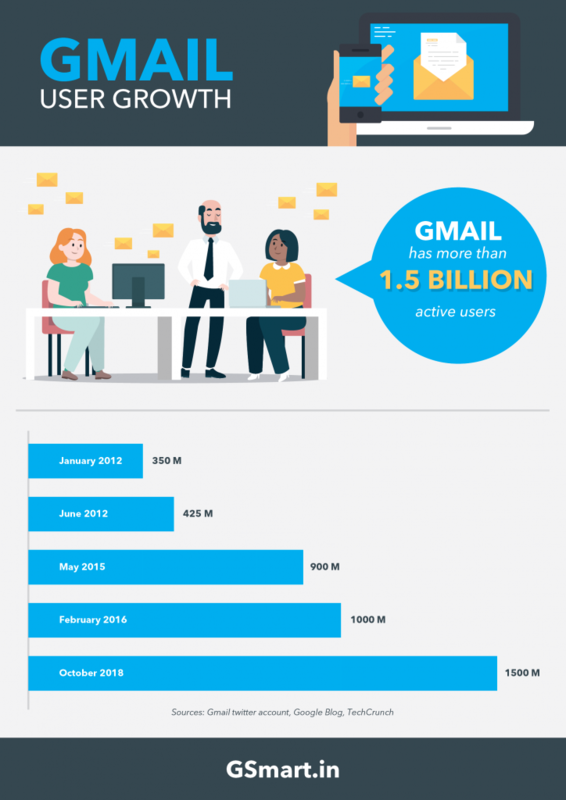 Gmail has over 1.5 billion active users. What started as an idea by Paul Buccheit several years ago has gone on to become one of the most prominent email suite in recent times. The project, with the code name, Caribou was first used in 2004 by Google employees to assess emails internally. It later moved from the limited beta status of April 1, 2004 to a full-fledge software on July 7, 2009. Gmail is known for its ease and convenience of use. Users can easily navigate or search up their emails or their email threads. While there are a lot of features on the Gmail app, the ones users found most interesting was the excellent user experience and the advanced spam filtering feature. As at October 26, 2018, Gmail, through a tweet, announced that it has over 1.5 billion active users. This is a significant increase from the 1 billion user-base announced in 2016. From these numbers, it is safe to say that every five people in the online world have one active Gmail account. Although, this means that there are 1.5billion active Gmail addresses, it doesn’t imply that the service is used by 1.5 billion people. This is because there are several people with multiple Gmail addresses. So, it is practically impossible to ascertain the precise number of active Gmail users. Users are open to choosing out of the 72 language options offered by Gmail, and these languages cover what about 94% of internet users speak. In May, 2014 Gmail Android app became the first to hit one billion installations. For the records, Gmail has grown from 425 million in 2012, to 900 million in 2015, 1 billion in 2016, and now 1.5 billion in 2018.